I also embedded the video for the Kickstater above. D.L. was kind enough to answer some questions about Legends of Log and the Kickstarter campgain for the Giant Size 2015 annual. We also discuss some of his influences. PC: So what’s the deal with Legends of Log? 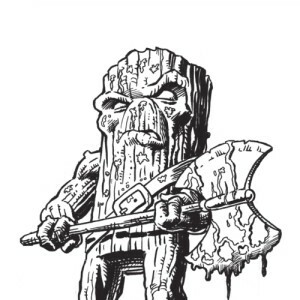 Did you receive some type of prophetic vision of Guardians of the Galaxy hitting big, and then proceeded to create your own wood-based hero to rival the great Groot? Seriously, where did you come up with such a crazy concept of a giant log with an ax? How would you describe the character? Log doesn’t compare to the great Groot, but the mighty Log does have his advantages. He carries a giant ax. So If they were to do battle, I’m pretty sure Log would be doing some heavy swinging. As for the idea, I came up with the concept of Log and his legends from a comic strip that I’ve been drawing since 2010. In the comic strip is a humorous talking log. He doesn’t carry an ax or anything like that. He’s just there to take the brunt of the jokes and punchlines tossed at him. Anyhow, In 2012, I imagined taking this character I had been drawing and changing him into a bigger and stronger log. A log that carried an ax and lived back in the days of the dark age. And is he big! He’s a giant compared to humans. I would describe him as the strong silent type. But when he gets mad, watch out! PC: I’m getting a big sword and sorcery vibe from these Legends of Log images. Do you have any favorite pulp characters or creators that may have influenced your work with Legends of Log? Log is mostly inspired by Conan the Barbarian books and comics. Along with others like Thongor, Brak the Barbarian, Kull the Destroyer and all those other types of characters. I read a lot of paperback books of sword and sorcery when I was a kid. From all the famous fantasy authors like Lin Carter, Andrew Oufftt, Michael Moorcock, Jack Vance, John Jakes, Fritz Leiber and of course, Robert E. Howard. PC: Tell us a little bit about the world Legends of Log takes place in. Log’s world is not that big. It’s mostly the size of a very large island with a lot of UN-known lands beyond that. Which makes it nice to expand if I ever decide to make Log’s world bigger. But right now it consist of the North Woods – where Log lives. The South Woods – where the angry Ax men hold a grudge. The Dark Woods – where warlocks and sorcerers conjure up dark magic. 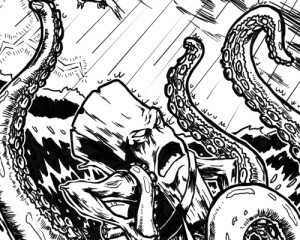 The Sea of Oceans, – where Mermaids and giant Krakens dwell. The Wildlands – a savage jungle that is lost in time, and the Outlands. – where beast and creatures roam. All these places are covered by the dark gloom of dark spells and sorcery created within the Dark Woods. And it’s are all after one thing. A living breathing giant chunk of wood called Log. 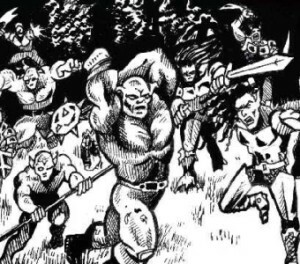 PC: For those of us who haven’t read Legends of Log before, how would you describe the tone of the series? Is it straight sword and sorcery? Is there any comedy? Although 90 percent of it is sword and sorcery. I did throw in some savage jungle girl stories where Log meets a girl named Corra from the Wildlands. As for comedy, well… I think the fact that since Log is a log and he carries an ax and yells, “TIMBERRRRR!” May say it all. PC: I took a look around your website and saw that you have produced three comics and two prose books pertaining to Legends of Log so far. 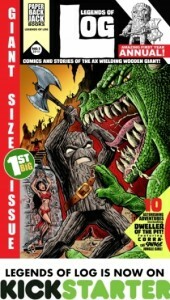 Does the Legends of Log Giant Size 2015 Annual include all new material? The book does include new material including three stories from the previous mini comics. PC: Are there multiple tales in the annual? Are the stories in the annual self-contained? Do readers need to pick up past issues or books or can we jump right in here? There are ten tales all together and they are all self-contained. The reader doesn’t have to read any other previous books or comics to enjoy the stories. But some of the stories do give hints and clues to a bigger story that will eventually happen to the mighty Log. And I can’t wait to tell that story. But it won’t happen till we get further down the road with the annuals. PC: The Kickstarter campaign for the Legends of Log Giant Size 2014 Annual is underway and will be active until October 6, 2014. I see you have a variety of tiers, from a price friendly PDF of the issue to some higher tiers, where a limited number of backers get to take part in the comics creation. 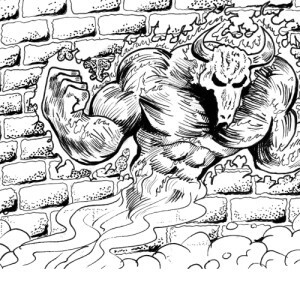 I think there is a tier there for everybody who is interested in a fun sword & sorcery book. 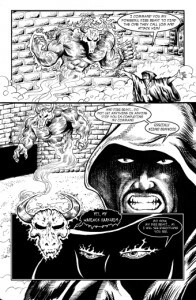 Do you have anything to say in closing to prospective backers out there who are fans of pulp and sword & sorcery? I’m a big fan of the pulp era and of sword & sorcery. The whole Legends of Log book is based on action and adventure. And although it may have a small extra punch of humor that you may not find in your normal S&S. I really think you might get a kick out of this book. I mean come-on, A log with an ax? What could be funner than that. PC: Thanks for answering my questions. I look forward to seeing the finished product. Thanks Jason for giving me the Opportunity. Keep up the great work on Pulp Crazy.